Most of us enjoy a night out sampling great food, but doesn’t it make it better knowing that the proceeds will be going to feed a family in the community? That’s what you’ll find at Eat 2 Feed TO events. The first event takes place on September 5, 2014 at The Depanneur Restaurant in Toronto. Eat 2 Feed TO is a series of events that will take place throughout the year to help fight hunger in Toronto. With each meal purchased, Eat 2 Feed TO will donate a meal in Toronto with the help of Second Harvest. Eat 2 Feed TO is the initiative of GOOD FOOD FOR GOOD founder Richa Gupta and Executive Chef Katherine Sowden. The evenings will feature world cuisine made with GOOD FOOD FOR GOOD sauces and spreads. GOOD FOOD FOR GOOD believes food should be made with only real ingredients and should be consumed fresh. They also believe the goal of a business is more than just the pursuit of profit. Their foods are handmade in Toronto using fresh, whole and mostly organic ingredients with no additives, preservatives, powders, extracts or concentrates. GFFG’s signature dips and spreads will be available for purchase at Eat 2 Feed TO events. 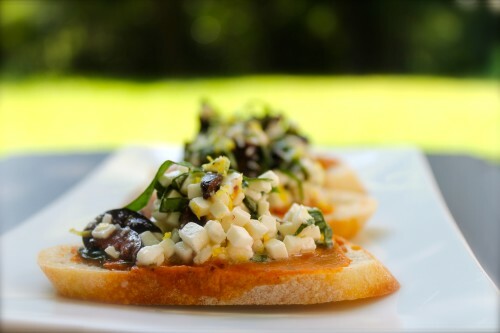 Mediterranean Bruschetta, $5, is a toasted baguette with GFFG Bunol Asado Fresh Mediterranean Spread, garnished with confetti made with feta, olives and chiffonade of basil seasoned with lemon juice, extra virgin olive oil, lemon zest and black pepper. Mild. Mumbai Mint Fresh Indian Spread, a chickpea spread with fresh mint, lime juice, tamarind and Indian spices. Bunol Asado Fresh Mediterranean Spread made from slow-roasted organic vegetables and served with confetti made from feta, olives and chiffonade of basil, and seasoned with lemon juice, extra virgin olive oil, lemon zest and black pepper. Comes with baguette. 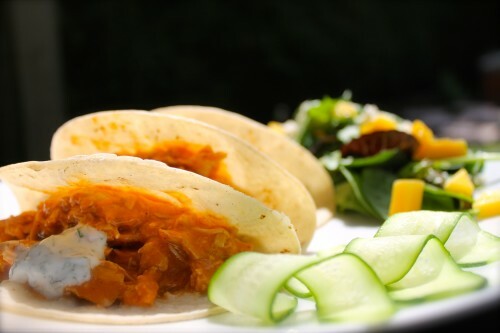 Pulled Butter Chicken Tacos, $12, features pulled chicken on corn tortillas with crunchy onions, cilantro mint yogurt and mint chutney. Served with fresh greens and mango salad. Mild. Vegetarian option available. 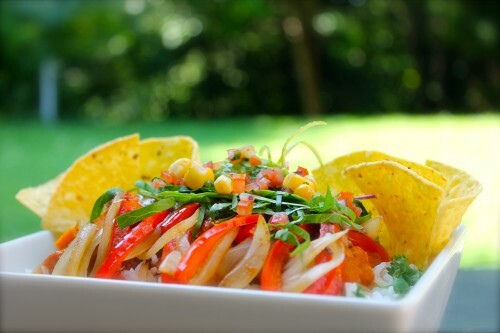 Eight-Layer Burrito Bowl, $12, features cilantro-lime rice with Oaxaca Arbol Spread and sautéed peppers and onions, topped with roasted sweet potato in GFFG Chiltomate sauce. Served with salad greens, fresh guacamole, corn salsa and crumbled Queso Fresco. Spicy. Add Chicken for $3. 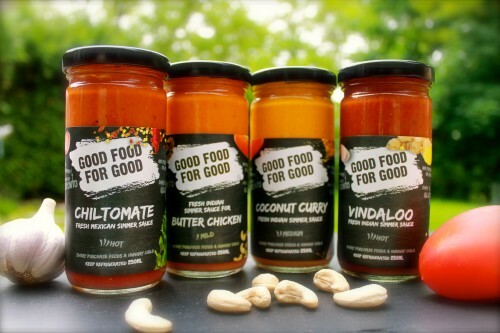 Richa Gupta launched GOOD FOOD FOR GOOD after experiencing immense dissatisfaction with the current food system. She felt that today’s packaged food compromises quality for convenience. Richa started the company with the vision to make a difference in the world by offering good food to people who can afford it and donating food to people who cannot. Eat 2 Feed TO takes place on Friday, September 5, 2014 from 6 p.m. to 9 p.m. at The Depanneur, 1033 College Street (at Havelock Street), 416-828-1990. No reservations required; just drop in! What a nice way to give back to the community. That Eight Layer Burrito Bowl looks scrumptious.